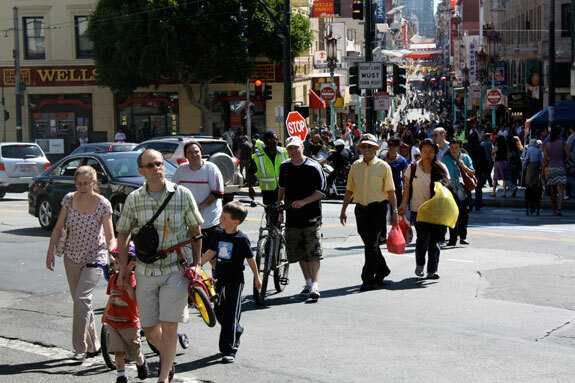 Thousands of people enjoyed a car-free Grant Avenue through Chinatown, North Beach and Telegraph Hill yesterday. Photos by Bryan Goebel. 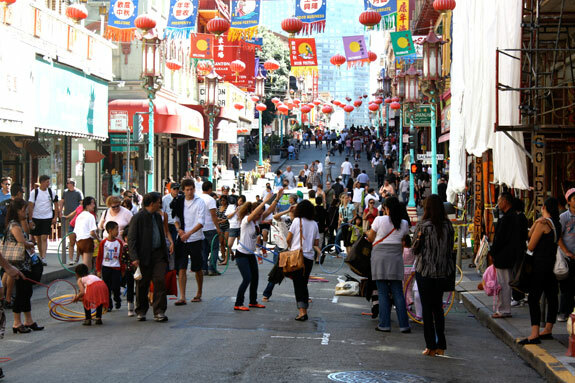 San Francisco’s Grant Avenue, the city’s oldest street, was opened to pedestrians only yesterday in a milestone Sunday Streets event that drew thousands of people to the historic neighborhoods of Chinatown and North Beach on a sunny, 74-degree day. The city’s first walking Sunday Streets on a thoroughfare that seems like one of the most ideal streets to pedestrianize was clearly a hit. “It’s a fantastic event. 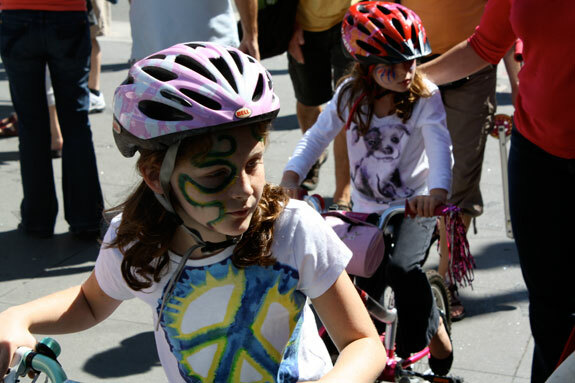 The weather is gorgeous and it’s nice to have Chinatown and North Beach connected in this way,” said Tom Radulovich of the non-profit Livable City, which sponsors Sunday Streets. 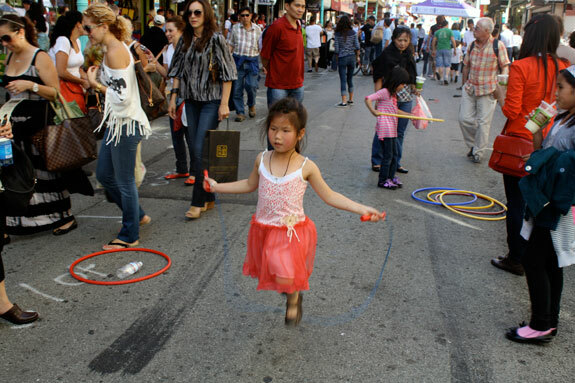 Unlike fairs in Chinatown and North Beach that typically line the street with outside vendors, the car-free event that spanned more than 20 blocks was organized to give neighborhood residents, locals and merchants a taste of what Grant Avenue can look and feel like without cars on a typical Sunday. 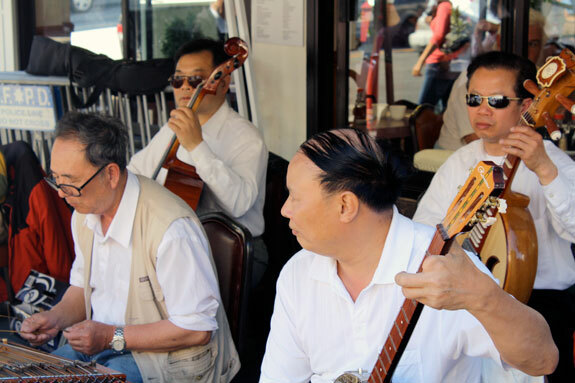 From the Chinatown Gateway to Coit Tower, people filled the narrow street on foot, and shopped, sipped tea, snapped photos, hula-hooped, painted, enjoyed live music and other activities without the anxiety of automobiles. 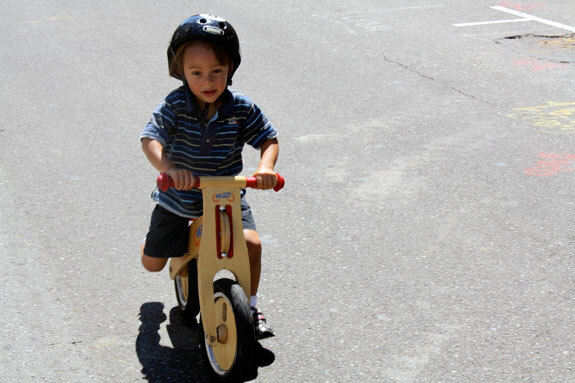 The few people on bicycles were mostly children whose parents walked alongside. 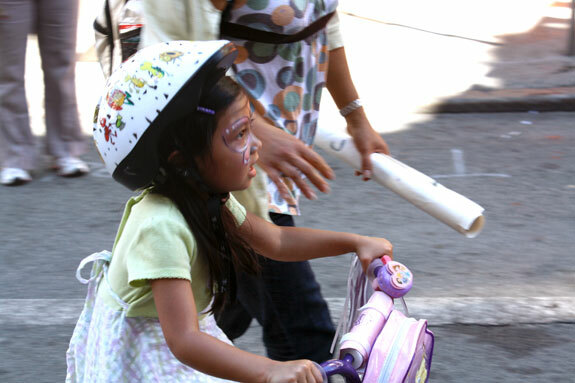 The San Francisco Bicycle Coalition set up its Freedom from Training Wheels workshop on Grant near Vallejo Street. 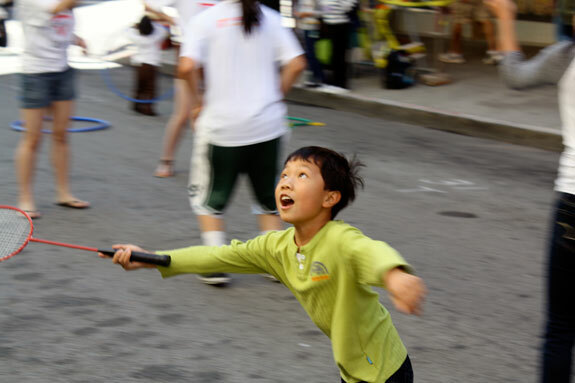 Many of the children spotted playing in the street live in North Beach, and Chinatown, the city’s densest neighborhood, where a majority of residents do not own cars, but are forced to contend with some of the city’s worst traffic. Along the route, there were plenty of children from other San Francisco and Bay Area neighborhoods, along with families of tourists. And now, it’s time to overwhelm you with some adorable moments. The sun really can wear you out. Yesterday's high was 74 degrees. Chinatown merchants seemed very pleased, said Vivian Chang, a senior planner for the Chinatown Community Development Center, which helped organize the event and do outreach. CCDC plans to conduct an official survey of merchants to get feedback. 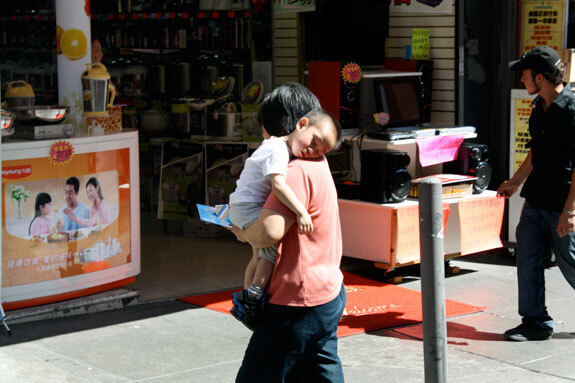 While Chang feels it’s probably too early for most merchants to get behind a permanent pedestrianization of Grant Avenue, yesterday’s Sunday Streets helped them realize the possibilities. Shell Thomas, the president of the North Beach Merchants Association, is also planning to survey merchants, but those he spoke to were happy. 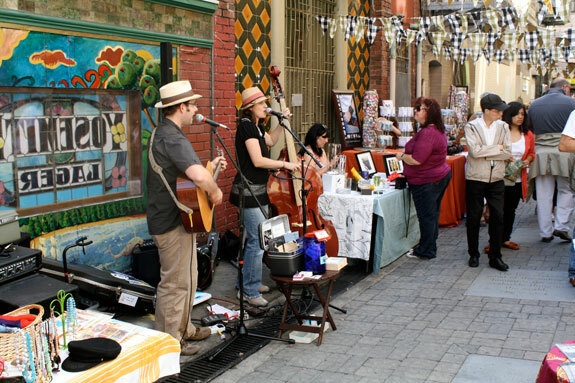 The fact that it was a walking Sunday Streets helped boost business on a skinny street lined with shops and restaurants. PCOs with stop signs halted traffic for the large crowds walking across Columbus and Broadway, two arterial streets that divide Grant Avenue. 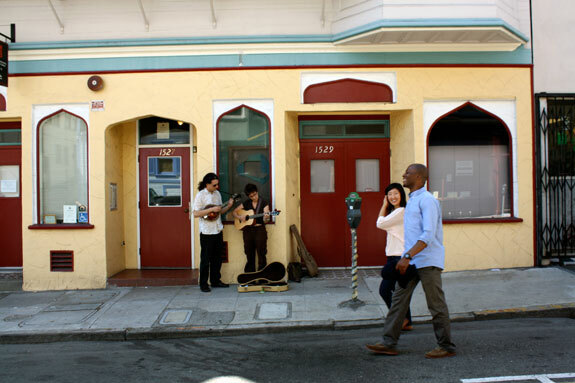 Enjoying a stroll on car-free, music filled Grant Avenue in North Beach. "A Fair to Remember" in Kerouac Alley. This gathering of musicians, under the "A Better Chinatown Tomorrow" tent, plays regularly at the corner of Columbus/Broadway/Grant, and captured a big audience for Sunday Streets. 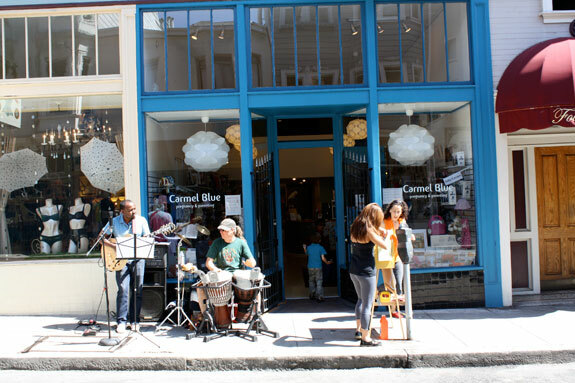 A band performs outside Carmel Blue on Grant between Green and Union. 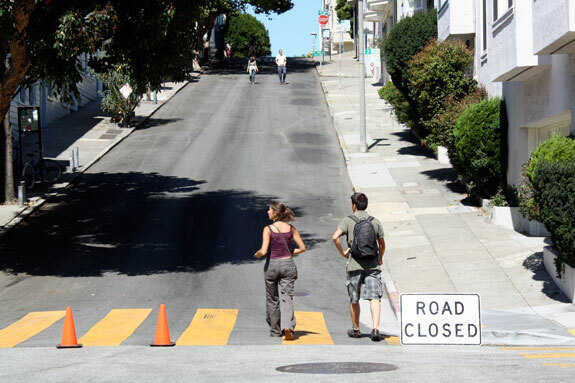 Some downhill fun on Grant between Filbert and Greenwich. On Grant looking south from Gerke Street near Greenwich. Walking up Grant at Filbert. 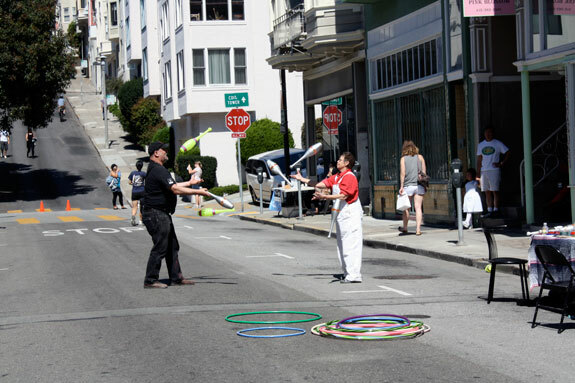 Some jugglers take to the street on Grant near Filbert. And we leave you with this shot. So cute. Also, check out these great photos from geekstinkbreath’s Flickr page. I had a lot of fun at this one! Will try to post my pics to the Streetsblog and Sunday Streets Flickr groups tonight. I have enjoyed the “off the beaten track” Sunday Streets (Western Addition, Tenderloin), although there are times I wonder if we’re better off focusing on routes like this, the Mission, and the Embarcadero- where there are just so many inherent destinations and a solid tourist base. Worth pondering further! This was a great event. And a permanent (or at least regular) car-free Grant Avenue makes a lot of sense. 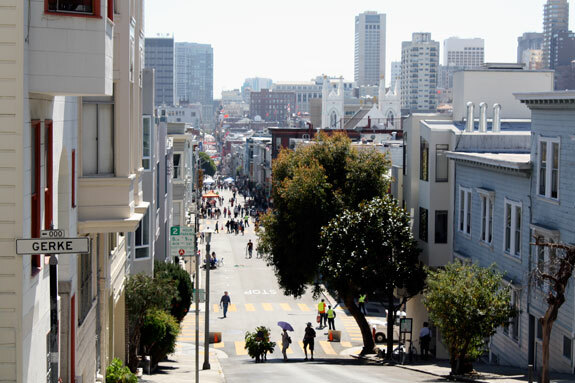 And it will be even better if the Muni light rail started serving Chinatown and North Beach. Normally, I’m so frustrated and uncomfortable at how crammed in I feel on the sidewalks of Grant Street, especially if I am trying to shop with my bike. On this Sunday, it was lovely, my friend and I shopped, strolled, and ate some great food on a street I typically avoid. Normally, Grant Street is so overcrowded by cars, forcing so many shoppers onto the tiny, overcrowded sidewalks. For this one day, the street was big enough for those of us who wanted to spend time and money on the street! 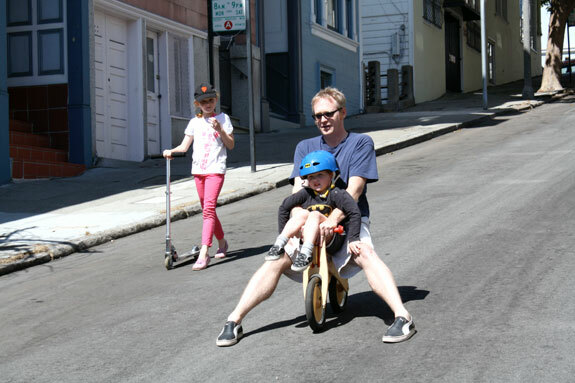 Good work, merchants, Sunday Streets, and the city! It seems so obvious to pedestrianize Grant Street, I don’t understand why the merchants aren’t screaming for it. I would guess an extremely small percentage of San Franciscans (less than 1%) has ever, in the entire history of their life, parked on the Chinatown blocks of Grant Street. In twenty-five years of living in San Francisco, I never have. And would anyone ever advise a tourist, “Sure, drive to Chinatown and look for parking on the street,” unless they were feeling particularly malicious? The comment in the article about inertia was apt. All this could be put in place in a matter of months without much cost if the will existed. It’s probably more about the merchants wanting parking for themselves (per nearly every business district, but especially Stockton/Grant in Chinatown where 80-90% of residents don’t even own cars). Maybe a couple more Sunday Streets will show them how much more valuable customers are than convenient parking for themselves. Time will tell. You may very well be right, but if these merchants are actually feeding the meters, they are paying over $560 a month ($3/hr x 45 hrs/wk) while the Portsmouth Garage that’s a block or two away for most of them is only $370/month (24/7) or $285/month (M-F 7am-7pm). Of course, if they are getting away with not feeding the meters, then one can understand their lack of desire to give up prime, free parking. The city would be better off giving these merchants a ten year pass to free parking in the Portsmouth Garage in exchange for pedestrianizing Grant Street, because making the area more attractive to tourists would build the tax base (sales tax, hotel tax, etc.) more than the city would lose in parking revenue. If parking really is the reason to not making Grant a pedestrian-only street, then build the Central Subway as soon as possible. Right now, public transit is terrible in Chinatown, even though this neighborhood has one of the lowest rates of car ownership in the city. Every single bus that goes through Chinatown is either standing-room-only or so full that the driver is not letting on more passengers. An underground subway can serve many more passengers than any amount of buses. If the city can fix the public transit situation in Chinatown, then the street parking situation will go away. That’s a good point on the cost analysis. But convenience is probably worth that $200 difference (along with the ability to cheat the system from time to time). I agree that it would be worth it to the city to offer at least a discounted parking pass to the garage for the merchants if that is really the hang-up. But I say give it 3-4 more Sundays (with a couple during peak tourist season) and they’ll come around with little to no carrot. Someone explain to me why it is wise to use scarce space on narrow public roads for storage or private property? (the parking of private cars) It seems only logical that private use of public spaces for storage should be a very low priority. To understand the parking situation on Grant Ave go there during the day when cars are allowed and count the number of meters with paid time on them. You will find something like 60% cars have disabled placard, 20% are in yellow zone, and 10% will have a person waiting in the car. Very few spaces have been paid for so the city is getting no money. And with respect to using a disabled placard, free all day parking for the business owners and workers who don’t live in the neighborhood! If Grant Ave becomes a ped zone then they would have to pay market rate for parking like everyone else. We really need parking placard reform.